Time for another recipe (the 8th in a baker’s dozen)! This is another that goes great with tea. Be adventurous and give her recipe a try with a pot of the tea named and assess the pairing for yourself. Your mom probably told you not to play with your food, but what about playing with your recipes? This cook does just that, taking a recipe and tweaking it here and there into something new. In this case, she has tweaked one of her own recipes, Potato Corn Chowder, reducing the amount of potatoes in it and swapping the heavy cream for lo-cal 1% milk. She suggests some clams or real bacon bits for a touch of protein, but they are strictly optional. The recipe is simple enough for even this non-cook to manage. Kenya is one of the key tea produces on the continent of Africa. The crop is a big part of their national economy. (See my article Teas from Africa: Kenya, Malawi, Uganda.) Their teas are in brands such as Barry’s, Lyon’s, and Bewley’s. Since they use the varietal of the tea plant called Camellia Sinensis assamica, the flavor tends to be in line with teas from the Assam region in India. 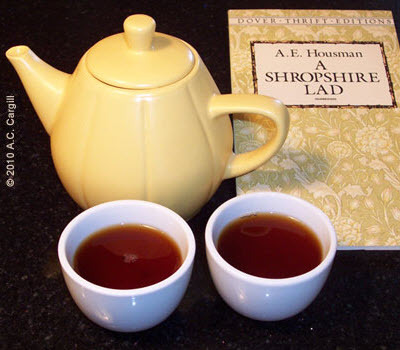 Assam teas tend to be malty and can be bitter, especially if steeped for the usual time of 5 minutes. The Kenyan versions seem to be free of this bitterness for the most part; it can also be steeped for only 2 to 3 minutes and yet produce as strong tasting cuppa as the Assam. That’s great for those who don’t use milk in their teas. Hope this works for you. Feel free to comment here with your experience, and watch for the next pairing to be posted in December.